1890. The barrow watering engine (fig. 503.) is a portable forcing pump, so arranged as to throw the water forty or fifty feet distance, either in the form of a spout or of a fine shower. The cistern commonly contains from twenty to thirty gallons of water; and, the frame which holds it being fitted up as a wheelbarrow, it may be wheeled round the garden; and the walks, borders, or even the compartments, to the extent of forty-five feet from the walk, may be watered completely. 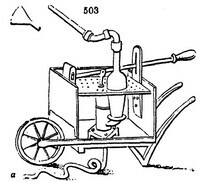 The most desirable variety of this machine is that which is furnished with a sucking-pipe (a), like the fire-engine, by means of which, if there be ponds or regular supplies by pipes or wells in a garden, the labour of carrying the water is avoided. Various other machines of this description have been invented from time to time by different persons, and with various success. The principal fault of all is, that they are subject to leakage.